Preparation for the World Cup is starting to get frantic. Teams are looking for friendly opponents who play a similar style to their first round opponents. Except the US of course. We open with England and also play Algeria and Slovenia. It would be a huge upset for us to come away with even one point vs the Brits. Our chance of advancing is beating Algeria and Slovenia. This is very possible and a good second round draw could get us deep into the tournament. Two friendlies in May are within easy and cheap travel distances and I may take in one or both. The Czech Republic is a short two hour drive to Hartford, Conneticut. This could be nice revenge for the fans of the 3-0 drubbing we took in WC 2006 in Germany. The second match is a few days later in Philly vs Hungary. That is a cheap $40 bus ride each way or a $150 round trip flight. There are purchasing options for tickets. Ticket Master is like a health car insurer with the exhorbitant fees. 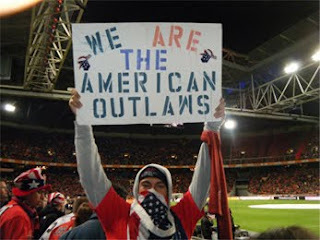 Another way to get them is through The American Outlaws. I am a member but don't want to sit behind the goal and sing for the whole match. I like to stand, and don't think anyone will be sitting anywhere in the stadium in Philly. With the exception of the Outlaws section, things will be wild but at times quiet. Rest period you know. I also keep up with the football happenings on Fox Soccer. It probably takes up 90% of my TV watching. Besides the games. FFF, Fox Football Fone In, is my favorite show on the tube. I enjoy Wynalda's independence and his take on players and teams. It's great to watch the European footall this time of year especially the EPL. MLS ends in Oct. and there is really not much in the way of sports on tv besides soccer, unless you like American style football or basketball. Only a short three months till opening match in South Africa. I have Spain winning the whole thing.